The Prime Minister, . Peter O’Neill, and Members of the National Parliament joined with the family of the Late Hon. 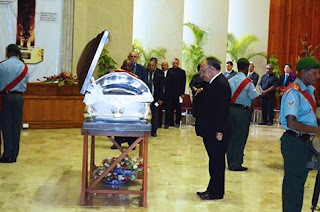 Aide Ganasi to bid farewell the Deputy Speaker and Member for South Fly at his State Funeral today in Port Moresby. Attending the funeral Service with Senior Cabinet Ministers and the Opposition Leader, the Prime Minister applauded the good work of the Late Deputy Speaker and committed to continuing his work in the South Fly District. “In his capacity as the South Fly Member of Parliament, and despite being a first-time MP, he served his people and envisioned the development of his electorate, province and Papua New Guinea as a whole,” PM O’Neill said. “For those of us who worked closely with Aide Ganasi we knew him as a man of respect and dignity. “He was a loving and caring family man, and a gentleman to his friends and colleagues who would never have a bad word to say about anyone. “His leadership was not without pain and struggles particularly with a challenge to his election early in his term. “He led by example and has left an important legacy, and as a Government we will continue to the work he had underway. “The Member for South Fly’s sudden passing had shocked the nation, and we have lost a great leader. The State funeral was held at the Rita Flynn Indoor Complex in Port Moresby.